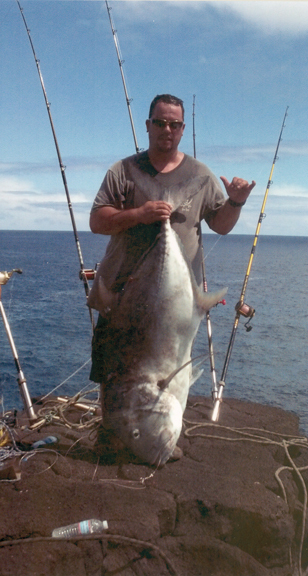 Moses Keola Toledo decided this would be his last ulua fishing trip for 2013. He slid his first bait at 10:10 a.m. (a frozen tohei tail) and to his amazement, an ulua appeared from the depths to investigate as the tail hit the water. Before Moses could get another bait in the water, he was hooked up. The battle raged for 18 minutes. Then the race to J. Hara Store began where the fish weighed in at 103 lbs. Moses used a 13-foot Slider pole, Penn Squall reel and 60-lb test Predator line to land his ulua.